Welcome to Winder Wonder, the very first edition of the Barrington fortnightly round-up of all things high-tech and brand new. From the latest peculiar gadgets and gizmos, to apps and software which could change your life forever, we’ll keep you fully briefed and more in sync than a vintage Rolex kept in a Barrington auto watch winder! So what’s been happening in technology land this April? Aren’t emotions exhausting? Happiness, sadness, anger and even apathy can really tire you out. Especially with all of that tedious â€œexpressingâ€ you have to do. 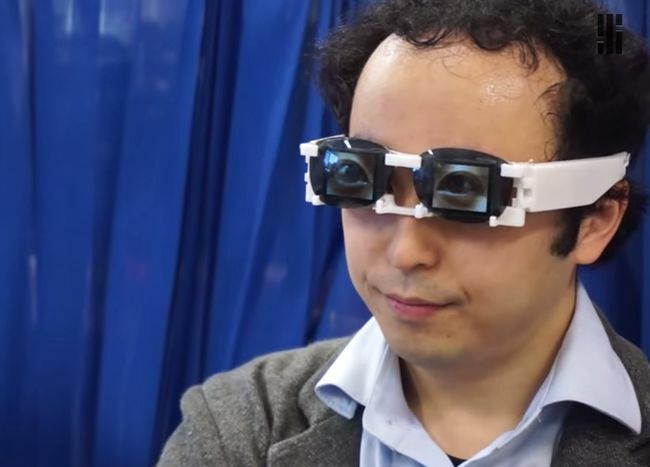 Fortunately Professor Hirotaka Osawa from Japan has invented a pair of glasses which display computer generated eye animations which mean you don’t have to expend any of your facial muscles to show how you feel. Dubbed â€œAgencyGlassâ€ this weird new gizmo consists of two OLED screens synced with a smartphone via bluetooth, the glasses blink when you nod and can even maintain eye contact when their facial recognition system kicks in. Don’t expect to see these in stores any time soon (or ever) though, we’re not soulless robots yet and Dr Osawa’s creation is really more of a thought experiment. Mix robotics, autonomous technology, predictive analytics and crowdsourcing and what do you have? A real life, white, thumb-shaped Robocop which can detect and prevent crime. The Knightscope K5 has been developed to reduce the deficiency crime causes in modern economies. The R2 D2-esque robot comes complete with 360 cameras, radiation sensors, chemical sensors, biological sensor and detectors for airborne pathogens. But that’s not all. The Knightscope also performs weather monitoring, numberplate recognition,Â facialÂ recognition and gestural recognition to detect out-of-the-ordinary behaviours. This slightly invasive machine is fully autonomous, just select your perimeter and deploy your robocop. If trouble should appear, the machine can then be manually controlled by security teams back at base â€“ all for just $3000 per month. Do You Have Money in Your Veins? A brand new, Swedish system could change our approach to biometrics and how we pay when we reach the shopping till. Forget about remembering your wallet or using fingerprint and retina scans, inventor Fredrik Liefland has designed a system which scans your palm, picking up the unique pattern of veins beneath your skin which are entirely individual to each person. Incredible glow in the dark road markings which use photo-luminiescing powder to charge up in the daytime and glow brightly at night have been put in place in Oss in the Netherlands. This brand new technology could also soon be temperature sensitive, indicating the presence of ice crystals on roads when conditions become cold and dangerous. With the UK cutting street lighting to save money on our motorways, could this be the future for Britain’s roads?